Ajisen ramen is a tonkotsu style ramen from Kumamoto city located in Kyushu Japan. I went to their Shinjuku store in the Kabuki-cho area during my last trip and tried their standard 味千ラーメン (ajisen ramen). 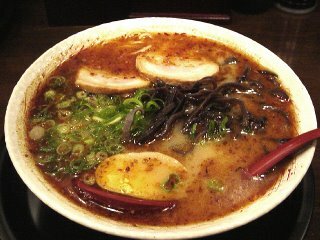 The Soup - was a mild flavored Kyushu style tonkotsu soup that is covered with a thin layer of brown oil which they call ajisen oil. The brown oil is infused with deep fried scallots, a spice often used in Taiwanese cuisine. The deep fried scallots have a strong aroma that hides the tonkotsu smell, which might dissapoint some fans of tonkotsu ramen. The Noodles - are regular thickness straight noodles cooked slightly firm. The Toppings - are a couple slices of thin cha-shu pork, a lot of sliced kikurage mushrooms, boiled egg and sliced green onions. Instead of the standard crushed raw garlic for toppings ajisen has a special deep fried garlic powder on every table, the powder is not as potent as raw garlic and I feel doesn't pack the same punch. They claim the powder gives you the garlic flavor without the bad breath. Overall - I am not a fan of the ajisen brown oil that they put in the soup, it just doesn't compliment the tonkotsu soup in my opinion. If you are in Japan I don't recommend Ajisen ramen, there are simply too many other options for better Kumamoto style tonkotsu ramen. If you are in LA and NY then give Ajisen a try and let me know how it tastes. Just wanted San Francisco Bay Area residents to know about Ajisen in Fremont - 47890 Warm Springs Blvd. Tried it once and this is a serious contender for local shops Halu and Santa. Still too new to really see what happens. Atmosphere is a bit clinical for ramen - I don't think there is a piece of wood in the shop. Anyway, same choices as Ajisen Japan - so this part is exciting. Ajisen has branches in Singapore and other parts of Southeast Asia as well. The verdict: TERRIBLE! Bland broth, overcooked noodles, sub-par toppings, overcooked egg. Tried more than three times at various outlets. No joy. In Singapore at least, it's becoming a ramen paradise with famous chains like Ippudo, Nantsuttei, Aoba and more setting up shop. You can do much better than getting ramen from Ajisen.